So I was having a discussion on this after taking out my friends flyer during a game and he did the usual rolling a 6 to see if it explodes. 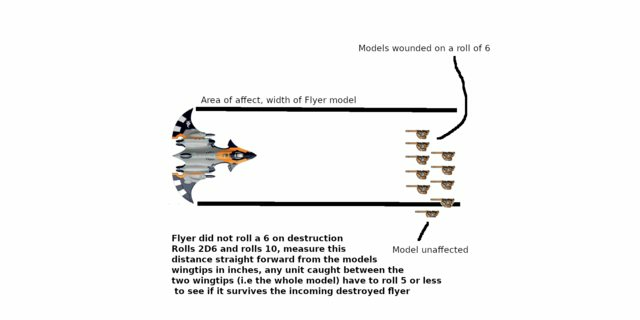 However, if they don't roll a six, then instead of the aircraft being removed, 2D6 should be rolled to get a distance length, then whichever way the flyer is facing, any model caught within the 2D6 Range within the width of the flyer has to roll a D6, on a 6+ the model takes a single wound. This would better simulate aircraft crashing to the ground rather just being removed and nothing happening. Would certainly make games more interesting especially when it comes to taking down aircraft. Aircrafts don't always crash nose first though. And what if the wings broke off at impact and never dragged on the ground to clip those who are "within the wing span"? What about aircrafts whose wings are angled and pointed upwards? Are you taking to consideratiom the height of the hull as well? Well there's realism and then there's being super realistic. And yes, aircraft do not always crash nose first but i'm trying to keep it simple in line with how the 8th ed rules simplified a lot of things. The width is just the width of the model so those with wings pointed up will have a narrower profile meaning they would hit less units. Height doesn't need to be taken into consideration, I think that given how hard the aircraft is going to hit being "Supersonic" even a Knight would wobble a bit. I'm playing the devils advocate here so just play along with me - what if someone modeled their wazdakka bomma with twice the wing length as to invoke the MFA. Its current wingspan is 24" wide. Do you suggest that if I roll a 12 on a 2d6, I get to sweep 48" wide and cause wounds to all units caught under on a roll of 6+? It would be easier to keep track using the base size as point of reference for measuring distance, not the wingspan. Could be interesting for a houserule (kind of like the dog fight in 7th ed) when both sides have alot of flyers. But I just don't see how this rule can be implemented & mainstreamed. The idea is that your opponent would think twice about placing any units in it's path and especially at close range because there's a high chance they will lose some models even if they manage to destroy the flyer. 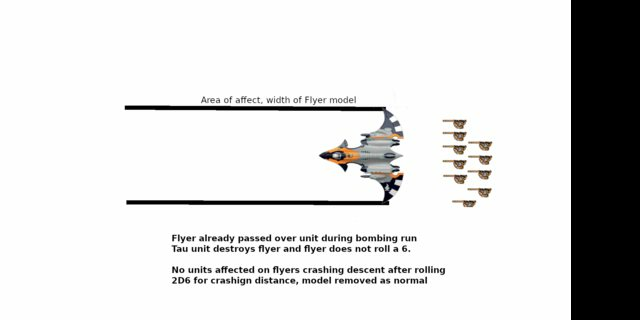 But then you'd be wanting to try and move your flyer into positions where you can still do bombing runs and your opponent would have to decide if you're worth shooting at with the risk of your flyer hitting their units. To also play devils advocate on a unrelated topic, unless I am mistaken and please correct me if i'm wrong, but with 8th edition there is no modeling for advantage in 8th. It seems that people still hold true to this for the sake of fair play and all which is great but RaW in the rulebook there isn't a modeling for advantage section. Its a cool idea though a brick shaped flyer would probably end up deviating if it was some how taken out of the sky though for simplicity sake just making the mechanic of it to go straight is fine. id say measure from the center of the flyer, roll 2d6 for distance. than from that spot roll a d6 or 2d6 for bigger flyers and then models within that radius takes mortal wounds or something. considering thematically it could be parts of the flyer falling off while the ship (at lore based altitudes) crash off screen. rather than making the ship do a full skid which would get complicated. unless I am mistaken and please correct me if i'm wrong, but with 8th edition there is no modeling for advantage in 8th. It seems that people still hold true to this for the sake of fair play and all which is great but RaW in the rulebook there isn't a modeling for advantage section. MFA has never been "illegal" per-se. Against for the same reason i thank god templates are gone. and has the potential to cause people to do the whole exactly coherency conga to avoid maximum damage. while the idea is cool it could be fussy. thats my only gripe with it. Yeah, maybe the base idea is better. You'd then get the effect of the aircraft having broken up so it's a smaller area of effect. Oh hell no. Nightmare to resolve, and TBH it doesn't even make much sense. Exploding on a 6 represents the aircraft breaking up immediately and debris falling on a unit below. If you don't roll that 6 just assume that its momentum carried the wreckage off the table before it hit the ground. How is it a nightmare to resolve? I thought i'd kept it incredibly simple. The only difference with this is that the width is dependent on the base size. Also, how does it not make sense? I'm sure i've seen plenty of war movies to see that although a plane may have been shot down some miles away doesn't mean it won't hit someone or something a little later on. You couldn't really abuse it either due to turning restrictions and minimum movement so shrewd players will be able to maneuver units around to avoid any potential losses while still attacking the flyer. It would only be one dice per model affected and the template would be the aircraft base (Not that I want to use the term template) but any model that is clearly covered by the base would be affected. And that would be completely, no half or a quarter, basically if you can't see the model with the base over it, then it counts as affected, no atoms thickness "I can see the base"
People make trouble out of no trouble like templates where supposedly they are source of all trouble when for example I have played over 20 years with zero problems with determining who's under and who's not. This I agree with, I never had problems with templates but I suppose with Tournaments and Cheese it can be open to abuse, but then I'm pretty sure that has always been the way since the 1st edition, it will never change no matter what rule is brought in. Such as the classic Tyranid Carnifex can't assault any units on the first floor of a building because it's not on the same level....have you seen the size of it, it would just tear the walls down. I tend to reflexively distrust mechanics that casually throw mortal wounds around because of the wildly disproportionate effect they have on low-wound-count armies. If you wanted to better-simulate aircraft it might make more sense to start by doing things like not letting fixed-forward weapons fire out the aircraft's backside, or letting them leave and return to the table without dying to simulate a wider combat airspace, rather than adding another weird edge-case mechanic that doesn't really do anything. 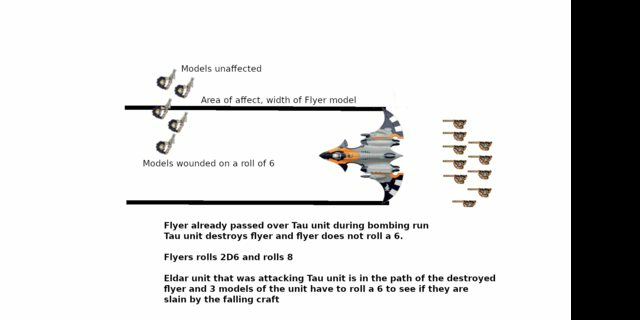 That makes a lot of sense, It would give Tau Craft a small advantage in dogfights due to the fact that some are armed with Drones and Turrets in the case of the Sunshark Bomber giving it a full 360 firing arc, whereas Imperial craft would be utterly deadly front facing but open to attack at the back. Because of the difficulty in trying to draw the lines accurately and determine which models are caught in its path. The Tau stratagem is a bad idea (for multiple reasons), but at least it involves drawing lines between two points at ground level. A flyer's wings set the edge of the path, but they're 6" or more off the table and there's no easy way to determine where exactly they cover. Because the flyer isn't getting shot down miles away, it's getting shot down over the table. On a 6 it breaks up immediately and debris rains down, on a 1-5 it takes fatal damage but continues on its current path far enough to crash off-table. Something off the table might be hit, but the rules don't care about it. Fair points, though I think it was adapted to use the base of the flyer as a guide to what gets covered or not so it's not drawing lines from the wings, more just moving the craft 2D6 forward and any covered units roll for damage. Or maybe instead of covering, if the base touches another base while moving forward that model rolls for damage, saves picking up and checking. The more it's talked about, the more I can see abuse taking place which is a shame, I like the game but the rules abuse does put me off playing slightly. 1: the flier explodes mid-air and showers weak damage on models within 6"
2: The flier skews into the ground, moving 2D6" straight ahead and then resolve as per 1, but with mortal wounds within 3"
3: The flier limps off the battlefield and does no damage. You could then allow special rules for Ork fliers, for example, to allow them to change direction before they crash land so that they can kamikaze the enemy. I like the first one, though the second one would be difficult to do unless you're counting the 3" radius from where it lands? No need for trigonometry, algebra or breaking out protractors. If you want over complicated scenarios where you account for every bloody 'if' event, have fun with your house rules where a game takes 12 hours to play. The beauty of 8th is the relative simplicity. It is one of the reasons it is so successful in bringing in new and old players. Hence why the original rule, at least in theory was, roll 2D6, move that distance forward, any unit caught in the path of the destroyed aircraft rolls a D6, on a 6 it takes a mortal wound. I thought it was extremely simple, measuring from the width was probably a bit much but using the base as a template to see if it touches a models base was a good addition I thought.